Before James J. Hill bought the Great Northern Railway in 1879 and accepted the task of completing the line from Crookston to the Canadian border, there already was a settler located on the area of the Middle River where Argyle is today. The man was a French Canadian named Gervais, and that’s not surprising since the French Canadians had been coming to the Red River Valley since the beginning of the 1800s. Gervais was cunning, and he had staked a claim right in the path of the railway line and called his community Louisa in honor of the French king. However, the James J. HIll gang outsmarted Gervais and located their railroad town just south of the Gervais property and subsequently south of the river and named the town Argyle. Argyle was incorporated in 1883. Because it is located all to one side of the river, it was relatively easy to dike off several years ago, so the community is safely protected from any threat of flooding. When the dike was built in 1988, the last of the “French Town” located on the river was bought out with federal program dollars and the last vestiges of Gervais town diappeared. The early settlement included a large number of French Canadians. A school and hospital was started in Argyle by the Sister of St. Joseph, who came from France. The first general store was started by a Verbonceur, who arrived by train from St. Paul, Minn. Other settlers included immigrants from England, Norway, Poland, Sweden, Scotland, and Germany. 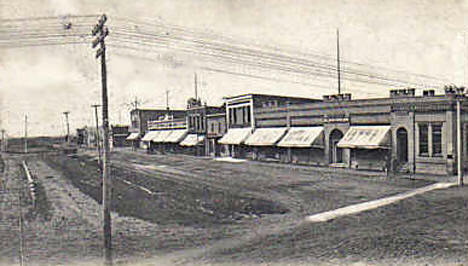 Olson and Holen started a department store, which was popular for a radius of many miles during the early part of the century. The early townspeople and businessmen were always anxious to make Argyle an attractive community to the region. Today the community still boasts of several businesses, which draw customers from the regional area. The ads in this newsprint reveal several businesses, which depend on the region to support a healthy commerce. At the same time, the strategic location of Argyle makes it a great place to raise a family and commute to one of the larger regional communities located within 45 minutes of Argyle.